Leopard Job Search Mobile App for Apple & Android. Never miss a legal job postings update or opportunity again! Now you can leverage the power of Leopard Job Search right from your Apple or Android smartphone or device. 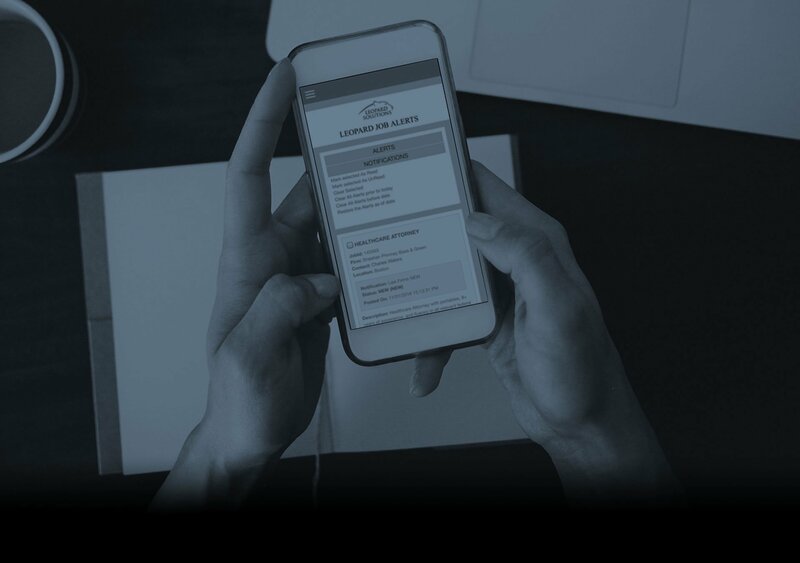 The new mobile Job App empowers Leopard Job Search subscribers to access, track and respond to the most comprehensive, real-time legal job opening updates in the industry while on-the-go. Always-on notifications so you can safely leave your desktop and know you’ll get the actionable job postings insight you need to act quickly on an opportunity. Delivery of ‘instant alerts’ that cannot be delayed by the typical ‘message clutter’ or technical challenges email servers may encounter. Available Exclusively to Subscribers of the Leopard Job Search Platform. Download the new Job App for your Android or Apple* smartphone or mobile device. *There is a nominal .99 cent fee to download the Job App from the Apple App Store. Not a Leopard Job Search Subscriber yet? Submit the form to request a free trial.